The Transparency International Georgia NGO has assessed the activities of the ninth parliament of Georgia in its first year, which covered the period from November 18, 2016, till December 31, 2017. Unlike previous gatherings, no plenary session was thwarted due to the absence of a quorum, the government presented the legislative plan twice, and unlike the parliament of the previous convocations, the Gender Equality Council was more active. “The involvement of civil society in the election of public officials has been strengthened: for example, the candidacy for the post of the Public Defender was selected based on consultations with the civil society representatives,” the NGO says. 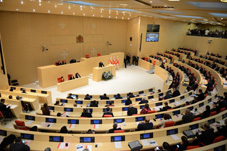 TI Georgia reported that during the first year of Parliament of the Ninth Convocation, MPs were more active in proposing legislative initiatives. During the period covered by the report, 92 MPs exercised this right. “Parliamentary opposition (minority, Faction National Movement) boycotted the work of the Parliament five times and did not participate in the plenary sessions seven times. “The President returned the legislative initiative five times back to the Parliament with motivated remarks. In all cases, the Parliament overrode the veto,” the NGO reports. The NG0 says that parliament’s activities to increase transparency carried out during the period covered by the report deserve a positive assessment. “Specifically, the implementation of the obligations envisaged by Open Parliament Action Plan 2017 increased the number of types of information subject to proactive disclosure, namely, various information categories were added,” TI Georgia says. The NGO wrote that the situation has worsened with regard to the systematically speeding up the hearing of draft laws without good reason. It also said that the activities of working groups in some cases were formal and group members were not involved in the process of elaboration of draft laws. “MPs do not make a proper use of the possibilities of oversight over the executive branch; in addition, the Ninth Convocation has introduced a practice of holding working meetings with the executive agencies. During the period covered by the study, no investigative commission was established, even concerning the issues as important as the abduction of Azerbaijani journalist Afgan Mukhtarli or the beating of former Auditor General Lasha Tordia,” TI Georgia says. “Parliament does not monitor the legislative plan presented by the government,” the NGO says. TI Georgia reported that during the very first year of Parliament of the Ninth Convocation, 2,119 instances of missing plenary sessions with the provision of acceptable excuse were recorded – of these, MPs indicated family circumstances as an excuse in 1,430 instances, which amounts to 68 percent of absences with the provision of admissible excuses.